Pepsi MAX® is proud to announce an exciting four-year European partnership between its iconic no-sugar cola brand, and one of the biggest and fastest growing music festivals in the world, Tomorrowland. For decades music has been a key part of the Pepsi DNA, exciting and unifying fans around a shared passion for music, from creating exciting campaigns and content to bringing fans closer to the globally renowned artists and emerging talent they love. 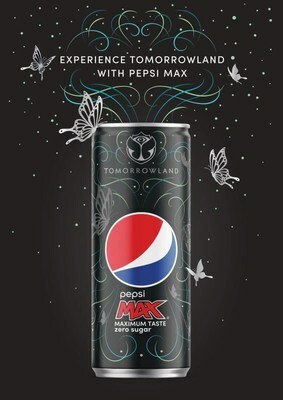 In a brand first, this summer Pepsi MAX will partner with Tomorrowland to serve as one of the main sponsors of the festival based in Belgium, with more than one million pre-ticket registrations and people travelling to the site from 200 countries. The partnership will open extraordinary opportunities for Pepsi MAX and festival fans, with digital activations and on-the-ground experiences across two weekends in July, 20th to 29th. At the heart of PepsiCo is Performance with Purpose – our fundamental belief that the success of our company is inextricably linked to the sustainability of the world around us. We believe that continuously improving the products we sell, operating responsibly to protect our planet and empowering people around the world enable PepsiCo to run a successful global company that creates long-term value for society and our shareholders. For more information, visit http://www.pepsico.com.